Nostalgia is all the rage right now, but a lot of throwbacks fall flat on their face. 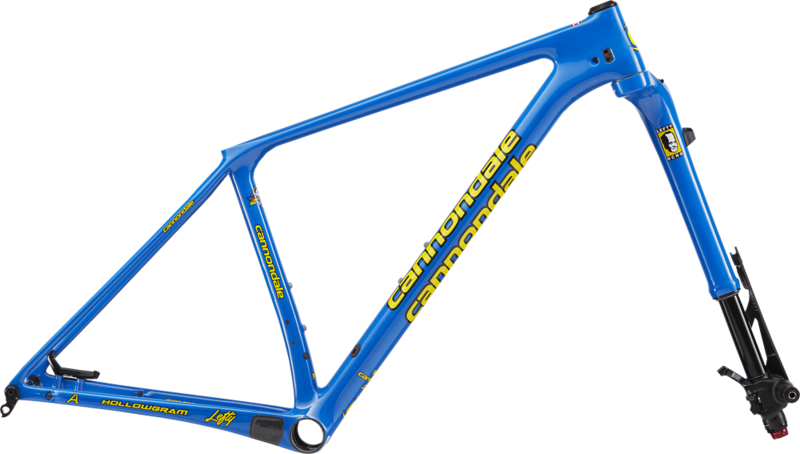 Not so with these new Cannondale XC frames. Cannondale’s Limited Edition F-Si throwback framesets are simply perfect. The two new F-Si Hi-MOD framesets come with matching Lefty Ocho forks and are painted in the classic livery from the early days of XC racing. Choose from Viper Red or Team Blue. I really love the Team Blue color-way with its yellow “quad-wrap” decals. It looks just like the classics, albeit without the head shock, raced in the late 90’s to early 2000’s. The Throwback F-Si is only available as a frameset, matching the latest carbon F-Si Hi-Mod frame to a color matched carbon Lefty Ocho fork. Viper Red harkens back to the 1994-97 team which competed at the first MTB Olympics, while Blue Gloss was the color of choice on CAAD3, 4 & 5 bikes raced from 1998-2002. The retro-themed, modern carbon 29er hardtails are packed with all the newest tech, including low, low & slack OutFront geometry, hi-mod BallisTec carbon construction, a PF30 BB, Boost-spaced Speed Release 12mm thru-axle, and Ai rear wheel/drivetrain offset. The fork is the top of the line 100mm travel Lefty Ocho Carbon 29er with remote lockout. Prices are steep, a frameset will set you back $4500, but man are they rad.